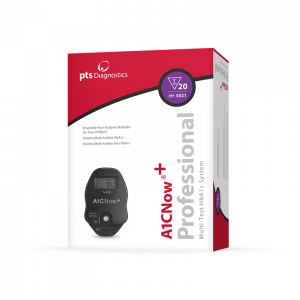 PTS A1CNow+® provides you with a fast and easy way of obtaining accurate A1C results in your office. This innovative technology enables you to communicate face-to-face with your patients about their diabetes control. Includes HbA1C Disposable Analyzer & Tests (10/Box). The A1c Now Plus is a disposable monitor used for the quantitative measurement of A1c in finger-stick or venous whole blood samples. With one drop of blood (5uL) and just three simple steps, you will receive fast results representing your patient’s overall blood sugar management over the last 3 months. The testing device is light-weight and portable, and testing can be easily performed in a physician’s office or a public health testing event. Results are available in 5 minutes. To ensure accuracy, the A1c Now+ utilizes both internal and external controls. Internally, the monitor performs over 50 internal chemical and electronic quality control checks with each test, including checks for potential hardware or software errors, and potential reagent strip errors. An error code is reported in place of a result if any quality check does not pass. External liquid controls are available for purchase in sets containing both levels 1 & 2. 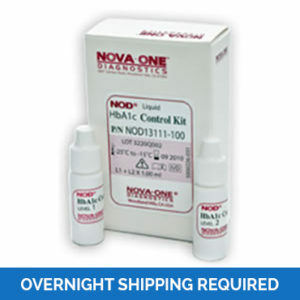 External controls offer additional confirmation of the stability and proper performance of the A1c Now+ reagents. A1C, also known as glycated hemoglobin or glycosylated hemoglobin, is an effective indicator of a patient’s blood sugar control over the last two to three months. A1C is formed when glucose in the blood binds irreversibly to hemoglobin to form a stable glycated hemoglobin complex, which remains viable for 90-120 days, the normal lifespan of a red blood cell. Only then can the A1c be eliminated as the red cells are replaced with new ones. A1C values are directly proportional to the concentration of glucose in the blood over the full life span of the red blood cells; therefore, the values are not subject to the fluctuations that are seen with daily blood glucose monitoring. The A1C value is an index of mean blood glucose over the past two to three months with the majority of that value weighted in the last thirty days. This bias is due to the body’s natural destruction and replacement of red blood cells. Because red blood cells are constantly being destroyed and replaced, it does not take 120 days to detect a clinically meaningful change in A1C following a significant change in mean blood glucose. A1c testing poses challenges for both physicians and patients. Doctors are faced the difficulty of managing their patients’ testing schedules and compliance rates while patients must make time every three months to complete these tests and then wait for days to receive their results. An industry survey of 6,000 diabetic patients found that two-thirds failed to meet the ADA’s A1c target levels. However, researchers discovered that immediate access and feedback to A1c results created significant improvements in patients’ glucose levels. 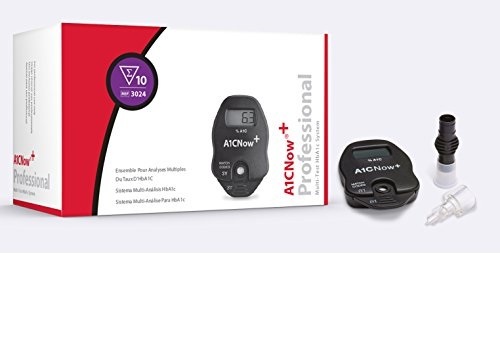 The American Diabetes Association (ADA) recommends the A1c Now+ as the best method of testing to monitor a patient’s A1c and insure that they are properly managing their long-range blood sugar levels.. The A1c test should be performed every 3 months for insulin-treated patients, during treatment changes, or when blood glucose is elevated. For stable patients on oral agents, the recommended frequency is at least twice per year.